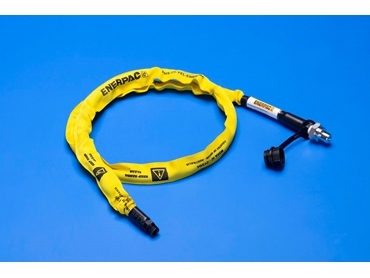 Enerpac’s MSHA sheath 700 bar hydraulic hoses are engineered to provide safety in the workplace, featuring MDG41 compliance for fluid power system safety at mines. With an MSHA rated abrasion and flame resistant diffusion sleeve, the new Enerpec hydraulic hoses can be used with all 700 bar (10,000 Psi) high pressure hydraulic equipment. The 700 series features a four layer design including two high-strength steel wire braids and an outside jacket of polyurethane to provide maximum abrasion resistance. These hydraulic hoses exhibit low volumetric expansion under pressure, which enhances overall hydraulic system efficiency. Enerpac manager for the mining industry, Mr. Pat Molloy says that the new MSHA-sheathed hydraulic hoses are designed for optimal safety in extraordinarily heavy or challenging lifting and manoeuvring operations.